The sacred Mountain Athos represents east ledge of peninsula Halkidiki in northern Greece, in 60 kilometres pressing in emerald waters of Aegean sea. The peninsula is a place mostly rounded by mountains, covered by dense woods, pitted by uncountable rocky ravines. In a southeast part of peninsula in height of 2033 metres above sea level there is a mountain called "Athos". In a pagan antiquity Athos mountain knew as Apoloniadu (from term 'Apollo'), later at the top of the mountain there was a temple "Zeus" which greek called as "Afos". 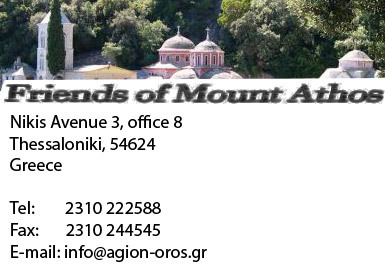 Friends of Sacred Mountain Athos» is a unique pilgrim centre. The aim of the company is to attract the public to enturies-old orthodox culture and history of Sacred Mountain Athos, and also to organize the excursions and pilgrim trips on Sacred Mountain Athos, visiting of orthodox relics of Greece and other countries. In programs offered by us the pilgrims receive unique possibility to visit a pantry of treasuries of St. Mountain Athos and to bow to its numerous relics. To take part in divine services and meals of monasteries, monasteries and cells, and also to meet and have a talk with confessors of St. Mountain Athos. It is a great possibility to see a monastic,ascetic life and the cleanest invariable Charters of Sacred Mountain Athos.